Gaden KhachoeShing Monastery is very blessed and honored by the upcoming visit of His Holiness Kyabje Trijang Choktrul Rinpoche from November 1st - 10th 2019. Gaden KhachoeShing is a Tibetan Buddhist monastery in Bloomington, IN (USA) dedicated to preserving the Buddha's teachings as transmitted by the Gelugpa lineage for the benefit of all beings. It officially opened in 2007 under the spiritual direction of the Venerable Choje (Kuten) Lama and with the blessings of the great lineage protector Dorje Shugden and many lineage masters. The name Gaden KhachoeShing was given by Dorje Shugden and carries deep spiritual meaning: Gaden is the name of the pure land (or heaven) of Maitreya Buddha, the next Buddha to come to earth, who has a special and strong connection to the Gaden lineage. 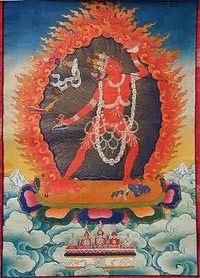 Khachoe is the name of the pure land of the female Buddha Vajrayogini, through whom one can attain enlightenment in just one short lifetime. Shing is the Tibetan word for the heavenly pure lands where one can go to attain enlightenment quickly. Many who visit Gaden KhachoeShing for the first time realize this name is remarkably fitting, for it resembles the pure lands described in traditional Buddhist texts. Encircled by a wide stream, the property rises 128 acres through lush forest to an area that opens up into several meadows, including a clearing that from aerial photographs looks like the shape of a left hand. At the same time, the site is only 15 minutes from downtown Bloomington. This combination of seclusion and proximity provides the ideal environment for religious study by offering the benefits of isolation from worldly affairs as well as easy access to all necessary amenities of daily life.